March Madness is in full swing, I am sitting here watching Minnesota play Michigan State and I about to turn it over and watch my Kentucky Wildcats play LSU. Yesterday while teaching 7th grade social studies I made a deal with the students that if they could stay quite for 5 minutes then I would turn the radio on. Of course this was just an easy way to get them quite and to listen to Kentucky play Ole Miss on the radio. If you love basketball like I do then you know that March is a word soaked in memories both enjoyable and gut wrenching. As a fan of Converse this time of year has been bitter sweet for a while. It was only last year that Converse finally returned to the NCAA after a 8 year absence from the stage in which it used to dominate. Of the 347 division 1 NCAA basketball teams there are only a handful that wear anything besides Nike or Adidas. Let me say this another way, 98% percent of the 347 D1 teams wear Nike or Adidas. Marquette wears Converse, Boston College wears Reebok, and I think there are 3 or 4 schools that wear New Balance. Needless to say, there is room for Converse to grow beyond Marquette and I truly hope that they will. All of this to say that there is hope, they've done it before and they can do it again. 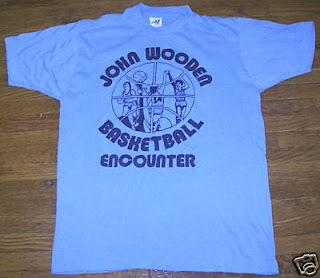 So what does John Wooden have to do with any of this. Everyone associates UCLA with Adidas and rightly so, but that was not always the case. In fact John Wooden used to be a Converse guy. For proof check out this fantastic t-shirt below. 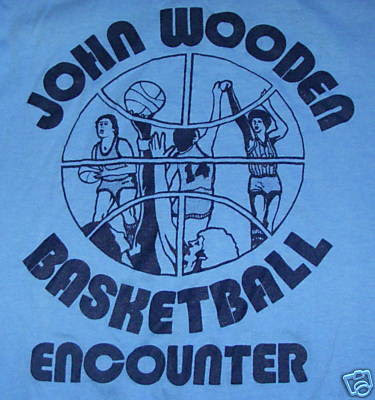 I must say that the John Wooden Basketball Encounter is one of the coolest names for a camp I've ever heard. Converse fans don't give up hope, cheer on Marquette and enjoy March. Thanks for checking out the blog! Under Armour is killing Converse in the shoe and outfit dept. The main problem is the basketball shoe area. 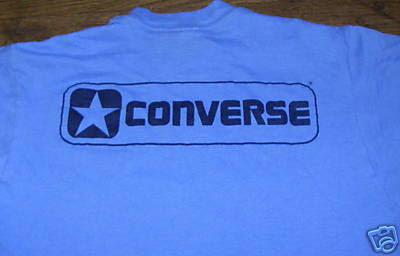 Converse need some stronger designs and franchise names to compete. Its time to updated the Weapon, Startech, etc. Im in NC and all I see is just Chucks which is not bad but if they want to get another college team they need to step up. Great t-shirt: I wonder if it's from the seventies. I don't know much about it, but Wooden worked with Wilson on a special Bata basketball sneaker. I thought you might be interested. I don't know if it ever came out. But the first thing he taught his players every year was how to put their socks on so they wouldn't cause blisters and how to tie their shoes so they would never come undone. He also had them wear basketball shoes that were a fingernail smaller in length than normal. I can't remember the reason why. Maneuverability?